I’ve been putting off writing this post for two weeks now. Why? Partly because I’ve been ridiculously busy with other activities and partly because I’m conflicted about the traditional southern potato salad. The chunky, seasoned white potato and mayo mixture is a mainstay on many southern and African-American tables during family gatherings, especially in the summer. However, it’s not the healthiest thing you can eat with its high fat content from the mayonnaise, and there in lies the conflict. I was never really crazy about potato salad while growing up, although almost everyone in my family was and still is (on my Dad’s side in particular, many are crazy about my mom’s potato salad). But, over the years I’ve come to enjoy a little dab of the homemade stuff every now and then (portion control is key). Speaking of homemade, if you’re going to eat potato salad, please, please, PLEASE, make sure it’s homemade! I’ve never tasted a store-bought, mayo-based potato salad I thought was any good, and I’ve been to a lot of church functions and back-yard cookouts where more and more people are taking the store-bought route. This recipe below is my attempt to get as close as possible to my mom’s recipe, which she pulls from her memory every time she makes it, adding ingredients by sight and feel rather than specific measurements. I called her up and asked her to give me her estimates of amounts used. Two things are key, she told me, to making a good potato salad — use a large, waxy variety of potato and “always use Duke’s” mayonnaise. My mom swears by Duke’s mayonnaise . She says that she has made potato salad with several other brands of mayo and she says it’s never as good as it is when it’s made with Duke’s. As for the potatoes, I used the kind she uses the most, large red potatoes. The main thing to remember for potatoes is to use a waxy, thin-skinned variety because they hold their shape better than, for example, russet potatoes, which are ideal for baking. What are your thoughts on potato salad? Do you love it, hate it or usually buy it by the container in the store? Let’s chat about it in the comments section below! Place rinsed and scrubbed potatoes in a large stockpot and fill the pot with water until the water covers the potatoes by one inch. Place the pot over high heat, cover and bring to a boil. Once water comes to a boil, reduce heat to med/medium-high, partially cover pot with lid allowing steam to come out, and cook potatoes for about 40 minutes or until fork-tender. Meanwhile, hard-boil your eggs  and set aside to cool. Peel and dice them once cooled. When potatoes are cooked, drain them from the water and set aside to cool. When the potatoes are cool enough to handle, peel the potatoes with your hands, dice the potatoes and add to a large mixing bowl. 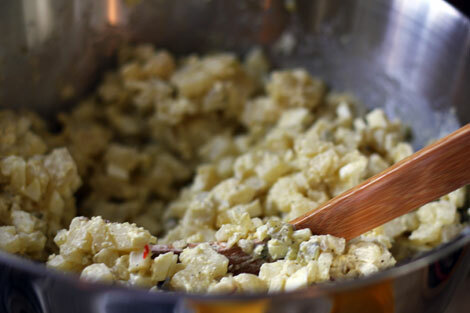 Add diced eggs and remaining ingredients except for the celery seeds, salt, and pepper and gently fold and combine everything together. Sprinkle celery seeds over mixture and add salt and pepper to taste gently folding and combining once more. Serve chilled or at room temperature.